Corvanatics annual dues are $10 with email delivery of newsletter and $15 with mailing of hard copy version. Membership includes a subscription to the bimonthly newsletter, CorvanAntics, and a membership card. Membership in Corsa is recommended; click here for more information about Corsa membership. First time members will receive their choice of either the Corvanatics patch, surface or window sticker, or magnet. You can see details of the patch and stickers and other Corvanatics merchandise available for purchase on the Merchandise page. Please enter your name or "anonymous"
Is your FC(s) in our Corvanatics FC Registry? If not, please send your VIN number and the paint and trim codes to support our decoding project. You can add multiple vehicles. Using Paypal: From the shopping cart you can click "Continue Shopping" to go to the Corvanatics Merchandise page: you'll find an assortment of Corvanatics merchandise. 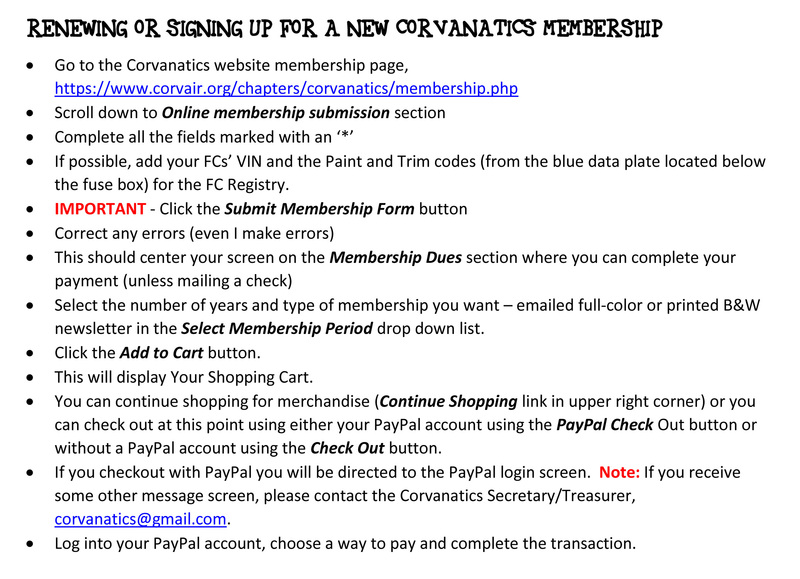 Using Paypal: From the shopping cart you can click "Continue Shopping" to go to the Corvanatics Merchandise page: you'll find an assortment of Corvanatics merchandise, and new members can select their free patch, window sticker or magnet. 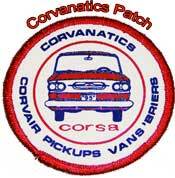 Would you like to have your Corvair 95(s) included in a vehicle registry? Corvanatics does not maintain a registry separate from that of our parent Corsa organization, and you can register your vehicles by clicking here. If you have one of these models and wish to register, contact Kent through CorvairKid .